Safe-haven buying triggered by US President Donald Trump’s decision to call off a meeting with North Korea pushed gold back above this critical level. The gold price was down slightly on Friday (May 25) after pushing through the US$1,300-per-ounce mark the previous day. Its rise was triggered by safe-haven buying on the back of US President Donald Trump’s decision to call off a meeting with North Korean leader Kim Jong Un. As of 8:40 a.m. EST on Friday, the precious metal was at US$1,304.20 — up US$18 from the same time last week. Gold is on track to make a weekly gain thanks to ongoing geopolitical tensions. “It is normal for some profit-taking to ensue after a surge [in prices]. 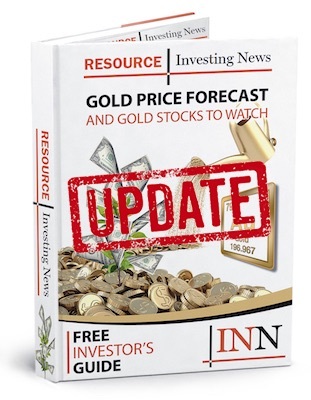 Still, gold appears to be anchored in the US$1,300-range, especially with the recent uptick in geopolitical tensions,” OCBC analyst Barnabas Gan told Reuters Friday morning. “The sustained uncertainty over [US-North Korea] negotiations will likely add further upside to gold prices given safe-haven demand,” he added. Interestingly, some market watchers believe that gold was set to rally regardless of Trump’s decision to bail on the scheduled meeting in North Korea. “Traders and investors like to search for reasons that markets sell off or rally, but the fact is gold was technically ready to rally, which is exactly what it did. Remember, all markets trade on technicals and money flow, not the news. Follow the market footprint, which will tell you the news before it comes out,” said Todd Horwitz in a Kitco post. Much like gold, silver was down on Friday, but made gains throughout the week as safe-haven demand grew on the back of rising geopolitical concerns. In addition to Trump’s North Korea decision, the white metal was also boosted by his threats to impose tariffs on auto imports. This drew criticism both abroad and at home, causing unstable conditions. According to Reuters, members of Trump’s own Republican Party warned of damage to the industry and raised the prospect of a global trade war that could harm American interests. Although the white metal eased Friday morning, like gold it was headed for a weekly gain, trading at US$16.60 per ounce as of 9:01 a.m. EST. Rounding out the week in metals is copper, which slid during the week as optimism over US-China trade talks faded. “If you enter a phase where trade growth slows down, then it is quite bad news for the Chinese economy,” said Oxford Economics commodities analyst Daniel Smith. “The risks around a lot of these things are definitely much higher than they were a few months ago,” he added. The base metal was trading at US$3.09 per pound as of Friday at 9:10 a.m. EST. Meanwhile, oil prices toppled this week after Saudi Arabia and Russia stated that they are ready to ease supply curbs; these cuts have helped push crude prices to their highest level since 2014. OPEC leaders are expected to meet in Vienna on June 22 to discuss reversing the production decrease, which removed 1.8 million barrels per day from the global market. The oil-rich nations will also discuss ramping up production. “If prices get above there, that will further intensify and increase the likelihood that OPEC will do something … It’s going to be very difficult to overcome this level on a sustainable basis before the OPEC meeting,” he added. As of 10:05 a.m. EST, oil prices were sitting at $68.65 per barrel.